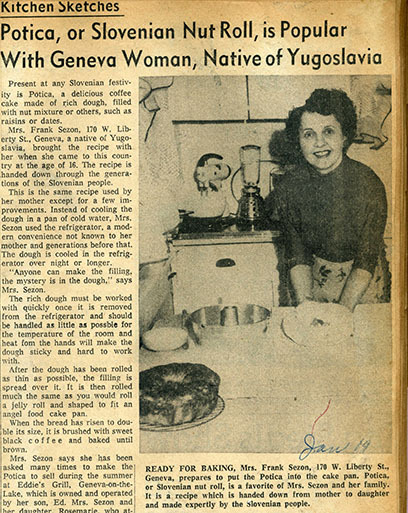 In a January 1956 Geneva Free Press, Mrs. Frank Sezon, 170 W. Liberty St., Geneva, shared her recipe for Potica, a nut roll. The ethnic dish is made by Slovenian people. Mrs. Sezon, mother of Eddie’s Grill entrepreneur Eddie Sezon, came to the United States at the age of 16 from Yugoslavia. Mrs. Sezon said the secret to Potica is in the dough; work it as quickly as possible after chilling it in the refrigerator, and handle it as little as possible. 2 cakes of yeast mixed in with 1 cup of milk and six egg yolks. Mix together with a spoon or fork, using the hands will make it sticky. Pat with flour and let it cool in the refrigerator overnight (minimal). Mix together. Remove the dough from the refrigerator, roll out half of it as thin as possible and spread with half of the filling. Roll and place in a greased angel food cake pan. Let it rise to double its size, brush wih sweet black coffee and bake at 400 degrees for 45 minutes until nicely brown and cool on cake rack. Makes two poticas (nut rolls). Mrs. Sezon commented in the article that she was often asked to make the nut roll for customers at her son’s hot dog stand.